“Two Sleepy People.” Words by Frank Loesser, music by Hoagy Carmichael. Recorded by Elsie Carlisle under the musical direction of George Scott-Wood on February 1, 1939 at Studio 1, Abbey Road, London. HMV B.D. 661 mx. OEA7516-1. “Two Sleepy People” was composed by Tin Pan Alley greats Hoagy Carmichael and Frank Loesser for the 1938 Paramount feature Thanks for the Memory, where it was introduced by Bob Hope and Shirley Ross. The song describes a young couple who, in spite of the late hour and an increasing lack of conversational topics, are nonetheless “too much in love to say goodnight.” Eventually we learn that they are married and that their late-night behavior predated their nuptials; their change in marital status appears to have done little to alter the long hours they keep. The idea of a married couple so happy together that they are willing to go through life rather exhausted is but the kernel of this excellent, perennial song’s success. For Elsie Carlisle, in the later years of her recording career, “Two Sleepy People” provides an opportunity to showcase the continuing and perhaps even increased sweetness of her voice and dramatic delivery. It also gives her the chance to describe herself as “me, your little snooks!” The payoff in cuteness is inestimable. 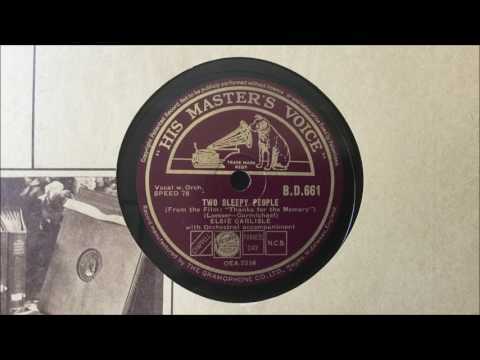 “Two Sleepy People” was recorded in late 1938 and early 1939 by Kay Kyser and His Orchestra (with vocalists Ginny Simms and Harry Babbit), Fats Waller and His Rhythm (with Fats himself singing), Hoagy Carmichael and Ella Logan (accompanied by Perry Botkin and His Orchestra), Chick Bullock, and Bob Crosby. It was broadcast four times by Artie Shaw and His Orchestra (the final time with vocalist Helen Forrest) and once by The Benny Goodman Quintet. Composer Hoagy Carmichael sang it in the 1939 short film Hoagy Carmichael with Jack Teagarden and His Orchestra. The song was recorded around the same time in Britain by Carroll Gibbons and the Savoy Hotel Orpheans (with singers Anne Lenner and George Melachrino), Geraldo and His Orchestra (with vocals by Al Bowlly), Joe Loss and His Band (with vocalist Chick Henderson), Victor Silvester and His Ballroom Orchestra, Ambrose and His Orchestra (with Vera Lynn and Denny Dennis), Brian Lawrance and His Orchestra (with Brian Lawrance doing the singing), M. Pierre and His Strict Dance Tempo Orchestra (directed by Harry Leader), Nat Gonella, Josephine Bradley and Her Ballroom Orchestra, and Maxwell Stewart’s Ballroom Melody (in a Paul Jones medley).